SNOOK:	Known for both their explosive topwater strike and their acrobatic, gill rattling fight, snook are generally found holding along the inland lagoons and mangrove-lined tidal channels which connect Belize's shallow-water flats. During times of strong climatic change, such as an extended period of wind or rain, the snook will often move out of the mangroves and school up at the mouths of the channel cuts; it is at this time, when the snook fishing can become "fast and furious." Snook are most often found in small schools, so remember to thoroughly concentrate on an area where a strike or hookup occurs. When is the best time of the day to fish for snook?Snook tend to feed most aggressively during periods of low light; therefore, the best fishing time will be during dawn and dusk. If you choose to fish for them during periods of bright light, deep running lures or flies should be used. Top water lures and flies should generally be fished during low light periods. Presentation: Snook often tend to hold near some sort of $'structure" (i.e., mangroves or logs) so an accurate presentation is very important. These fish usually won't move far from their lair to take your offering. FLY FISHING FOR SNOOK: The fly fisherman can take snook with a variety of subsurface and surface flies. The key to success is perseverance. Because the majority of your fishing will not be sight casting, repetitive bad casting over potential snook holding areas will be the standard procedure. Once snook are located, remain in the same spot and change patterns until fish are regularly taking the same pattern. Leaders/Tippets: Snook will typically blast out of a nighmarish mangrove tangle to take your fly and then try to race back into it in a frantic attempt to wrap you around every root they can find. With this in mind, a straight shot of 20-lb. L.L. Bean tippet material or Mason hard nylon tippet material connected to twelve inches of 60-lb shock tippet will allow you to keep them out of the "bushes." A shock tippet is used because snook have razor sharp gill plates which cut through smaller diameter monofilament with ease. Flies: Snook seem to prefer bright flies with red, yellow, chartreuse, and orange as the predominant colors. Often, they can be caught on surface poppers, so a combination of the following selection is recommended. Subsurface: "Punch" series (Lime, Tropical, and Sabalo) 2/0; Seaducer (yellow/red) 2/0; Lefty's Deceiver (red/yellow & green/white) 2/0. Surface: Gaines saltwater poppers (yellow/red & blue/white). 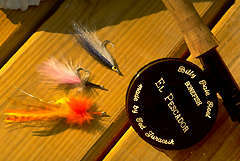 Fly Lines: In addition to a floating line, you may want to have a sinking line on hand. At dawn and dusk, a floating line should be used with surface poppers, since the snook will usually come up out of the deep water in search of baitfish holding closer to the surface. If you plan to fish for snook during periods of bright light, a full sink line is recommended. Suggested sinking lines: Teeny Nymph line T-300, or the slower sinking Scientific Anglers Wet Cel Uniform Sink IV. Rod/Reel: A stiff 9 or 10 weight rod of the same type discussed in the tarpon section. SPINNING/ CASTING FOR SNOOK: A wide variety of jigs and surface plugs (covering all depths and types of water) is important because it is hard to say exactly which lure the snook will find enticing at any given moment. You will likely have to try several before you find a "hot" one. Presentation: Snook are a somewhat transient fish, often moving from place to place depending on water conditions and the availability of food. Because of this, a common practice is to troll along or cast with a "locator" lure until the fish are found and then stop and cast to them after the first hookup occurs. It's best to keep switching lures until strikes start occurring. Surface: Follow tarpon guidelines, but add a propeller-type surface lure like a 1/2 oz. Luhr-Jenson's "Bass Agitator" to the selection. (red/white, yellow/black and red spots, silver foil). Subsurface: Again, tarpon selection will apply, but add two types of crankbaits: Bomber "Model 7A" 1/2 oz. 3 1/2" (fire tiger) and Bilf Lewis "Rattle Trap" 3/4 oz. (chartreuse shiner and/or chrome/black back). Jigs: 3/4 and I oz. saltwater lead head jig with a 3 1/2" and/or 4" "sassy shad" type plastic "grubs" (chartreuselblack back and shad). Bucktail jigs in the same color/size combination can also produce fish. Rod/Reel: Will be the same as those used for tarpon. Line: Again, follow the tarpon guidelines but use 14-17 lb test.